Product #1629 | SKU 1407067 | 0.0 (no ratings yet) Thanks for your rating! The Fast and Compact Photojournalist: This standard focal length offers special qualities which make it wellsuited for portraiture. 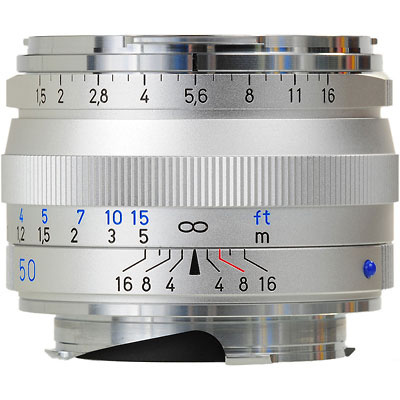 The ‘C’ designation in the C Sonnar T* 1,5/50 ZM name means both ‘compact’ and ‘classic’. The lens design and aperture geometry reflect its predecessor from the 1930s, the Sonnar 1,5/50, which was the fastest standard lens of its time. The excellent flare control inherent of the Sonnar lens design is further optimized with the ZEISS T* anti-reflection coating. This new lens stays true to its heritage, physically resembling the objectives of by gone days. With its fast aperture, taking photographs with a beautiful ‘bokeh’ that reflect the ambiance of the golden age of rangefinder photography is as simple as pressing a button. The Carl Zeiss range of T* ZM-mount lenses offers high standards in terms of performance, reliability and, of course, image quality. You can count on highly advanced flare control for crisp and brilliant images, and virtually zero geometric distortion that ensures precise accuracy when reproducing shapes, especially useful when photographing products and architecture.